Shot with a cool stillness that has a tendency to freeze the imagery, this is a film of evocative moods and twisted allegiances: we canâ€™t justify the killing of these victims (although I did get some satisfaction out of the bullies getting theirs as they torture Oskar in the final scene), but we like this girl, we appreciate their friendship, we root for her to protect this tormented boy. And then we watch her feed on the local population as a matter of survival, whether they are served up by her guardian (Per Ragnar), who takes the outward appearance of a father figure with paternal affections but may simply be a servant in her thrall (a Renfield with better grooming and social graces), or hunted by Eli herself. A scene where the neighborhood drunk, part of the group that gathers every night at the pub, finds Eli huddled under the bridge, has a lovely delicacy to it: he tenderly picks up the seemingly fragile and freezing girl to carry her to safety. But the lighting and composition evokes (then upends) the scene in A Clockwork Orange where the droogs beat a tramp. Eli is no droog, sheâ€™s a predator and this is a â€œwounded animalâ€ trap. The vulnerability and tenderness turn feral when she does. 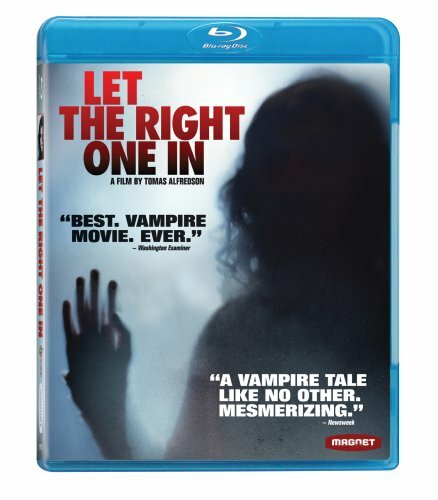 Let the Right One In refreshes the genre by recasting the vampire lore in an evocative setting and adding new edges (Eli sounds like a jungle cat on the kill when she attacks), unusual moods and a skewed sensibility. Also note that the film is released on Blu-ray as well as DVD. Nic Balthazar’s Ben X (Film Movement) is not a subtle film, but it is driven with such passion and emotion that I was riveted throughout the drama. Balthazar based his story, about a teenage boy with Aspergerâ€™s Syndrome (a mild form of autism) who suffers from bullying at a public school and escapes his torment in an online video game world (a place where he at least understands â€œthe rulesâ€), on a real life event, but transformed it in the telling. He wrote it first as a novel and then as a play. This screen incarnation marks his directorial debut and he embraces the storytelling possibilities that film offers, a cinematic recreation that is neither stagebound nor literal. But whatâ€™s most satisfying is how Balthazar takes the situations and cues familiar from years of (often very good, just as often completely exploitative) movies about teen suicide, high school violence and bullying, and kids who escape into the fantasy of video games, and defies expectations with each step. Not flamboyantly, not even necessarily defiantly, but with a measure of compassion and empowerment. Through internal monologues, he gives voice to a boy who is unable to express his feelings or thoughts, and he shares with us his feeling of helplessness as he’s picked on, tormented and humiliated. I can’t testify as to how accurately Balthazar expresses the experience of a boy suffering from Aspergerâ€™s Syndrome, but from my limited experience it is a valiant and dedicated effort to explain and understand, a film that is empathetic to the external symptoms and behaviors and sensitive to the internal life of the person beneath the behavior. And while the film ends in a fantasy of empowerment, there’s nothing false or insincere in that fantasy. We know all too well how these stories usually end, as does Balthazar. His small triumph is a gift of hope to his character and to the audience. I, for one, appreciate it. “My parents never talked about the occupation,” remarks the adult FranÃ§ois Grimbert (Mathieu Amalric) in Claude Miller’s A Secret (Strand), adapted from Philippe Grimbertâ€™s semi-autobiographical novel. “They hid it like a shameful secret.” The secret found at the end of the film is shameful only in the guilt that it dredges up in his parents (played by CÃ©cile De France and Patrick Bruel), French Jews who survived the war but lost so much they cannot talk about. The film shifts through the years as their son (played as an adult by Mathieu Amalric) recounts their story and his, offering no judgment, only sympathy and understanding. Miller’s dramatic understatement and haunting direction sets a fitting mood for such understanding. The second animated feature from Walt Disney Pictures, gets a newly remastered edition for its Blu-ray debut in the Pinocchio: 70th Anniversary Platinum Edition . The clarity in the Blu-ray edition is stunning and manages to smooth out the film grain without losing the texture of the paint and ink artwork. I review it on MSN here. Also remastered, but decidedly less impressive, is Koch Visionâ€™s new edition of the Fleischer Bros.â€™ only animated feature, the 1939 Gulliver’s Travels , for both DVD and Blu-ray. The problems are partly from a less-than-stellar source print, but more importantly the decision to master the Academy ratio film in widescreen by hacking off information from the top and bottom of the image. Dave Kehr reflects on both animated releases at the New York Times here. See also Gary W. Tooze on the Gulliver’s Travels Blu-ray at DVD Beaver here. Luchino Viscontiâ€™s swan song Lâ€™Innocente debuts on DVD from Koch Lorber. Richard Brody writes about it at The New Yorker here.